Miracle RepaiRx Protective Leave In Conditioner adds definition while replenishing moisture to hair, restoring softness and shine. This intense conditioner uses coconut oil and black honey to treat hair, reducing split ends and promoting hair growth. Free from parabens, sulfates, petrolatum, lanolin, artificial colors, or animal testing. Directions: Wash hair with tgin Miracle RepaiRx Moisturizing Shampoo to cleanse scalp and remove excess product buildup. Follow with tgin Miracle RepaiRx Revitalizing Conditioner. Rinse out. 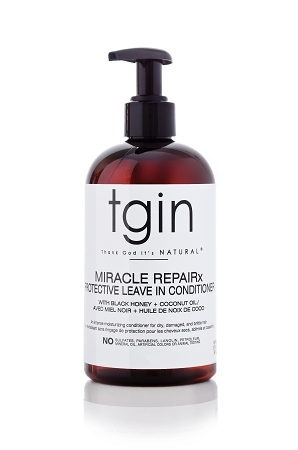 Apply tgin Miracle RepaiRx Protective Leave in Conditioner to wet hair and style as usual. INGREDIENTS: WATER(AQUA), RAW BLACK HONEY, COCOS NUCIFERA (COCONUT) OIL, AGAVE AMERICANA LEAF (AGAVE) EXTRACT, CARICA PAPAYA FRUIT (PAPAYA) EXTRACT, GINGER ROOT (GINGER) EXTRACT, GARDENIA TAHITENSIS (MONOI) FLOWER EXTRACT, EUTERPE OLERACEA (ACAI) FRUIT EXTRACT, SCLEROCARYA BIRREA (MARULA) SEED OIL, CAMELLIA SINENSIS LEAF (GREEN TEA) EXTRACT, BUTYROSPERMUM PARKII (SHEA BUTTER), THEOBROMAGRANDIFLORUM (CUPUACU) BUTTER, ARGANIA SPINOSA (ARGAN) KERNEL OIL, PRUNUS AMYGDALUS DULCIS (SWEET ALMOND) OIL, PROPANEDIOL, CETEARYL ALCOHOL, CETYL ALCOHOL, DIMETHICONE, BEHENTRIMONIUM METHOSULFATE, PHENOXYETHANOL, CAPRYLYL GLYCOL, DISODIUM EDTA, ROSEMARY EXTRACT, PATHENOL (PRO VITAMIN B5), TOCOPHERYL ACETATE (VITAMIN E), FRAGRANCE. I was already enjoying the original line, but the Miracle RepaiRx line is so much more amazing, if that were even possible. My very 4c hair is super moisturized and very manageable after use. After my deep condition for about 40 minutes with the serum, I add the leave-in and a little more serum from this line, and the magic continues. I never want to run out; will always keep product on hand. I love this leave in. I like to add it in the shower right after washing my hair. It defines my hair and makes it easy to detangle. It also smoothes my strands and adds some shine. It smells great, just like the rest of the line. I recently did the big chop and have been trying to figure out this whole 3,abc,4 thing lol! I loved this leave in because its lightweight and my hair seems to like it. My hair always feel really soft after applying it. my hair feels oh so soft. Ok I see you tgin! You have yet again created a product formulated to take all the coins! I havent seen one split end since using this and my hair feels oh so soft.